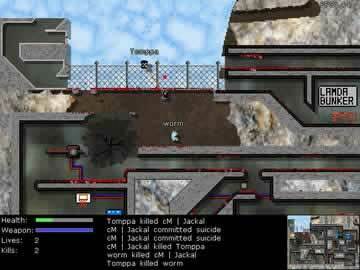 Liero Extreme Game - Download and Play Free Version! The battle begins! It's worm against worm in this enhanced classic! It's time to battle! Face up to 7 AI competitors in this version or go online and match wits with other players to see which group of worms will reign supreme! Similar to the incredibly popular Worms 2, you will enjoy the zany battles. 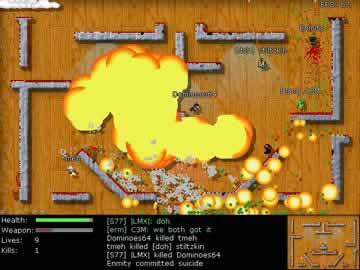 Master over 40 weapons in this frantic real-time struggle! If you have a sensitive nature and don't like a good fight, Liero Extreme may not be for you. This game is for those who like games where you have to battle your way to ultimate supremecy! There are four different play modes: Game of Tag, Kill 'em All, Capture the Flag and Simple CTF. Choose your game wisely as you may be playing for a while (very addicting) trying to conquer the underground. Watch a clip from this action packed dual in Liero Extreme.